The Charles H. Kent home was built in 1843 in the West Main Street district and is now located at 125 N. Pearl St. It is an example of Gothic revival. Charles was the son of Zenas, two years younger than his brother Marvin, and married to Mary E. Burrett. Charles was involved in the dry goods business with his father in Ravenna. In 1860 he opened a dry goods and wallpaper store in Kent and also was an original investor and a director of the Kent INation Bank. Charles died 1887. In 1902, the house was moved 150 feet north of its original location along West Main Street to the current site on North Pearl Street. It was placed on the National Register of Historic Places on February 23, 1978. Once known as the Patton Memorial House, the family residence of W. W. Patton, his wife, Harriet, and daughter, Emma, was built in 1902. 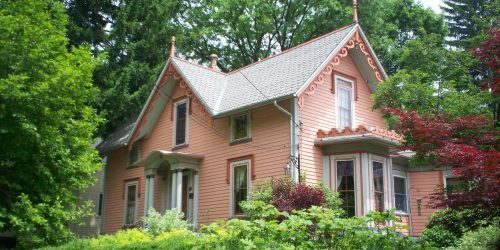 Construction began in 1880 on the Eastlake-style homestead of Marvin and Maria Kent.